Here's a very 21st century form of abuse - nursing home employees taking photos and videos of residents with cellphones and then ridiculing them on social media. A recent ProPublica report documented abuses in assisted living centers and nursing homes by way of social media, including at least 47 instances since 2012. As a result, the Centers for Medicare and Medicaid Services (CMS) demanded that state health departments check that all such residences have policies prohibiting staff from taking demeaning resident photos. State officials also must quickly investigate any complaints and report offending workers to state agencies for possible discipline. The CMS directive states that nursing homes have a responsibility to prohibit abuse, to protect the privacy of residents, to provide training on abuse prevention and to investigate all allegations of abuse. 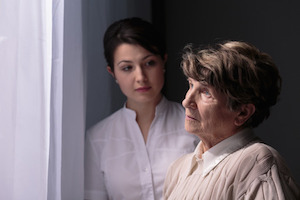 Nursing homes and other like facilities that fail to live up to these responsibilities can face citations, fines and even termination from Medicare eligibility. The photos and videos have appeared in social media platforms including Facebook, Snapchat and Instagram. Images of abuse were shown as well as photos of residents covered in feces, naked and even deceased. To remain eligible for Medicare or Medicaid funds, nursing homes and assisted living centers must comply with federal nursing home regulations including those contained in the Nursing Home Reform Act. Some states have harsher laws that go beyond the federal requirements including punishing social media abuse. Most state laws protecting these vulnerable residents have not been updated in years - well before the explosion of social media apps available on portable devices. As of this writing, Florida elder abuse law does not specifically address social media exploitation. Total bans of cellphone use at nursing home and assisted living facilities are difficult to enforce. The CMS directive emphasizes "responsibility" and "privacy" and care centers must take steps to educate their employees. They must also establish policies that can detect and root out this type of abuse and, even more importantly, ensure that social media abuse doesn't happen in the first place. If you or a family member has experienced nursing home abuse or neglect or any other personal injury, please contact us immediately. Our experienced attorneys have the right expertise to fight for the compensation you deserve. Please call us for a free consultation. Attorneys Diana Santa Maria and Laura D. Dolin, personal injury attorneys in Fort Lauderdale, will fight to secure justice for you and your family. You can reach us at (954) 434-1077 or contact us via the website.